I'll probably not post til after the holidays, but I look forward to bringing you some great new stories as we move into 2010. 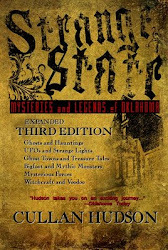 Look forward to seeing several new books from me this coming year, including the sequel to Strange State. Only recently learned of this one, but I'll be sure to pick up a copy. I love Crichton's work (even if it did get a bit spotty in later years). 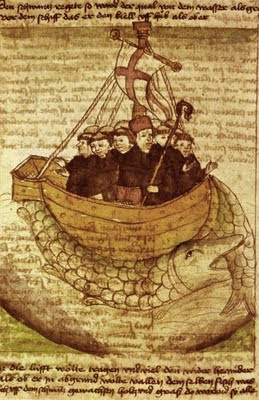 The blog "The Big Study" has a recent post postulating that famed Irish monk St. Brendan's fabled journey may have reached beyond the shores of North America and deep into West Virginia. I'm Sorry, Sir. These Bones Belong To A Young Lady. 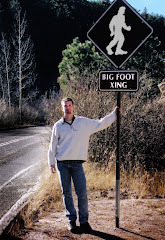 Loren Coleman's got a post detailing the events surrounding the latest Bigfoot image to come to public attention. All I can say is, here we go again... But maybe Moneymaker will get his bill passed now. Loren Coleman's recent post over at Cryptomundo attempts to answer the age-old question of why researchers cannot find Sasquatch bones by postulating a specific (and unexpected) culprit on the classic scavenger dispersement theory: Porcupines. I've posed other explanations on this blog before. I think if it is real, then finding NO bones whatsoever becomes very hard to explain. After all, even among the more elusive animals, we do find bones occasionaly. 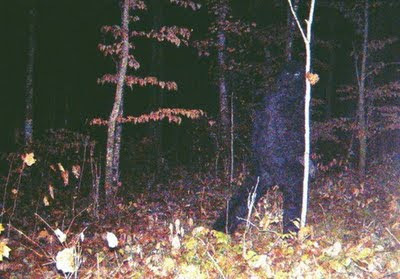 Speaking of Bigfoot... "Shadows in the Night"
I can recall completely every indelible moment of that strange night in the summer of '81. It haunts me still to this day. I was staying with my grandparents for the summer on their modest farm in rural southwestern Missouri. It was more of a hobby for the retired couple than an actual working farm. There were as many unusual animals (peacocks and guinea fowl) as there were the requisite chickens and pigs. At eight years old, I was big enough to help out by feeding the animals, picking vegetables, and collecting eggs. Then, when all the chores were done and twilight melted into another balmy Missouri night, we would settle in to one of grandma's delcious meals. I loved those nights on the farm. It was a world far-removed from the noisy city nights, awash in an apocalyptic orange glow from thousands of streetlights. On the farm, the clear, black sky exhaled a billion stars while a fat, white moon hung brightly, as if for the first time. We had scarcely sat down to dinner when a commotion erupted from the enclosure at the back of the property where the pigs and hogs were kept. At first, we didn't think much of it. They were a skittish lot at best and outbursts like these were not unheard of. Grandpa figured the dog, Jet, was harassing them or perhaps a frustrated coyote was pacing the fence line. Whatever it was, it could, grandpa figured, wait until he finished he fried chicken. Suddenly, another sound erupted from the yard. This one, however, pierced through the night and our apathy with a spine-chilling cry, shattering the pastoral calm. Grandpa jumped up, grabbed a flashlight and his shotgun, and burst out the back door. I was not but two beats behind, racing to catch up. As we neared the pen, I caught sight of a looming, dark form grappling with one of the pigs. It wasn't a man as far as I could tell, but it was man-like: it stood on two legs but was entirely covered with hair. In the flashlight, its eyes glistened like topaz. Grandpa raised his gun, and in a flash, fired a thunderous volley toward the creature. I started. My chest pounded with adrenaline and my ears rang from the blast. Frightened, but apparently unharmed, the thing stood up and ran toward the rear of the pen where it was able to leap the four and a half foot fence. The creature then scrambled up an embankment and disappeared into the dark confines of the woods beyond. My grandfather used to tell my brother and I stories of ape-men that dwelled in the woods and creeks of the Ozarks. He had encountered one years before down in Arkansas as he camped along a river. A rustling in the brush from the opposite bank caused him to glance up at a largy, hairy biped. The two stared at each other for a moment and then the creature simply dissolved back into the woods. After my own encounter, his stories didn't sound like tall tales spun to snare the imaginations of young boys. They now possessed a frightening thread of truth. UPDATE! 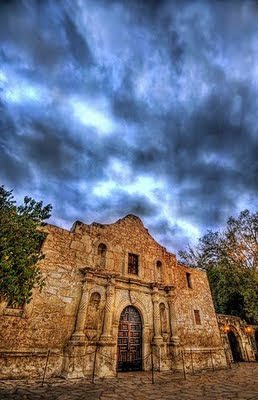 Bigfoot On The Loose In San Antonio? UPDATE! While the witnesses might not be of the highest calibre, the sheer number of them begs the question: just what was it they saw? UPDATE: Apparently at least one group finds the testimonies of these witnesses to be beyond reproach and are taking a serious look at some "tracks" they've discovered. ANOTHER UPDATE: Loren Coleman speculates on what might have produced the tracks found. "multiple eyewitnesses who claimed that they saw a hairy, hominid standing over six feet tall, run out of the woods and kill a deer"
What Is It, Lassie? Is Timmy's Spirit Stuck In The Well? It started out simply enough with a little show called Ghost Hunters, but as the ratings poured in (arguably for various reasons) the knock offs started to multiply like bored rabbits. Just when you thought the phenomenon of paranormal reality television had reached its saturation point, the universe found a way to squeeze out another. Enter Animal Planet's entry into the arena, a little show called "The Haunted", which will examine the correlation between pets and poltergeists. My head hurts already. 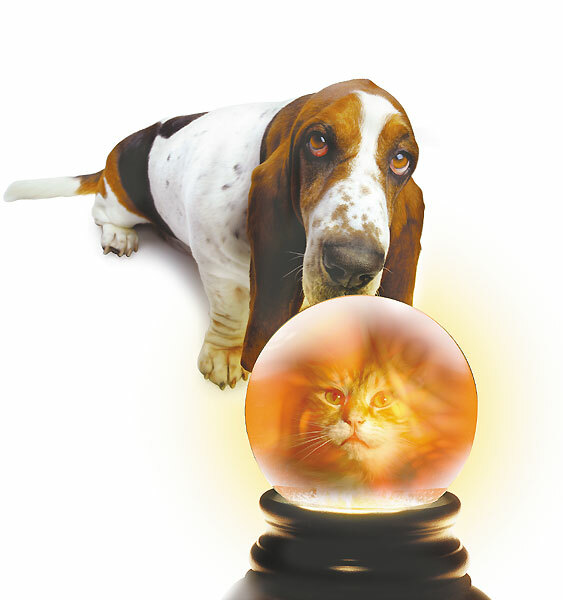 If you've a pet you feel is especially sensitive to the spirit realm, they are taking submissions for real-life accounts of paranormal pets. WIN A COPY OF STRUCK! Author Keith Pyeatt will host a contest via his Horror With Heart newsletter. Prizes include a copy of his latest novel, Struck.